On Sundays, many places close down. So, it’s a great time to just go walk about the city and window shop to see what new places you might like to patronize when they’re open. Just stay away from La Rambla – it’s usually a mad house, and today was no different (I crossed over to get to a street I wanted to find.) I started exploring my new neighborhood. There are lots of bakeries and confection houses that look delicious and tempting, at least from the windows. I wanted to find Banitsa, as I remembered walking past it with Karina. As it turns out, it’s only a few blocks away and it’s open on Sundays! Banitsa is an artisan pastry shop (self-described) run by this charming woman who is eager to explain her creations. She works mostly with phyllo, which I love, and then she does an assortment of flourless cakes, as well. She prides herself on using the freshest ingredients, and I believe it after tasting one of her cheese and berry pastries today. It was very light, not very sweet, and it worked perfectly with a cup of fresh ginger tea. 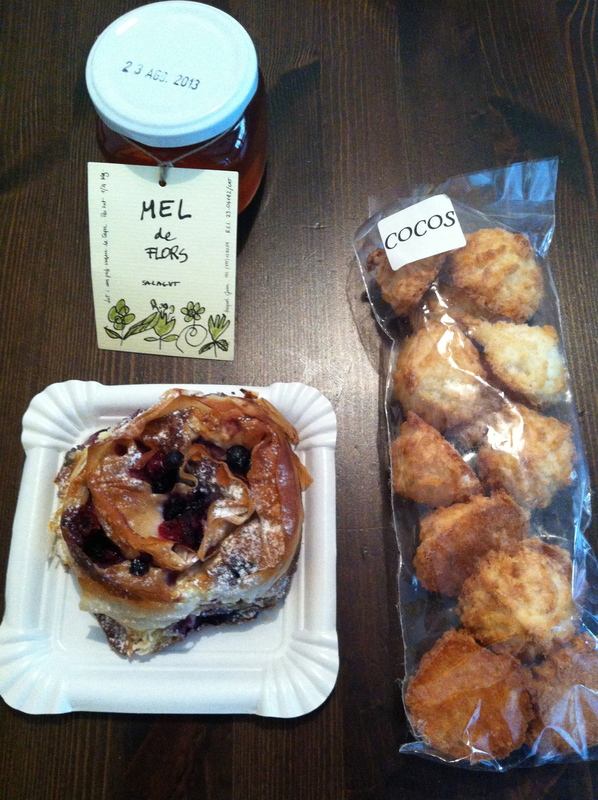 The pastry I bought is pictured at top, with all of the other items I bought today. Check out the shop at http://www.banitsa.es/la-pasteleria.html. I also passed about a dozen chocolate shops I want to try. Dangerous. 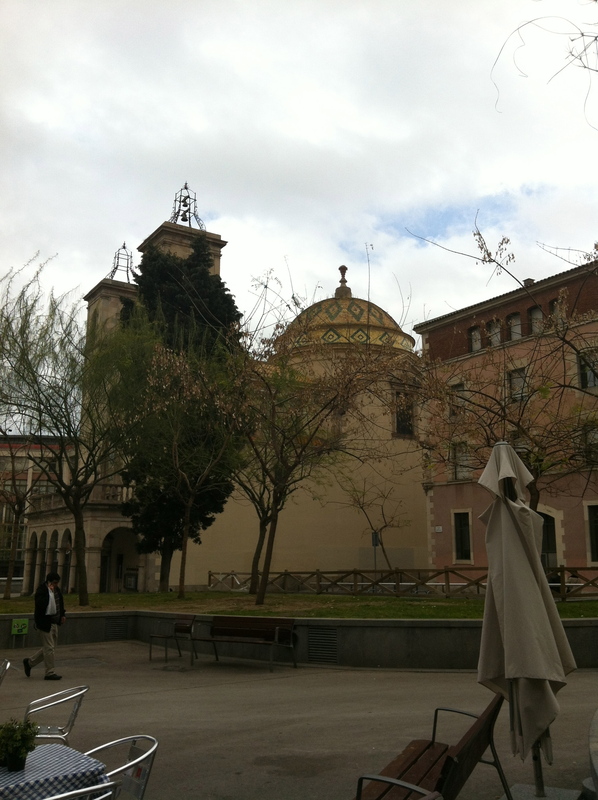 I worked my way through the area where the Universitat metro is, and of course, this is a university area. I found an Asian grocer, which I’m excited about. But, I was not too excited that they wanted $9 for a bottle of Siracha. As much as I am addicted to that stuff, the price was too ridiculous. However, it’s good to know there’s a 2nd Asian grocer within walking distance (C found the first one the last time he was here). 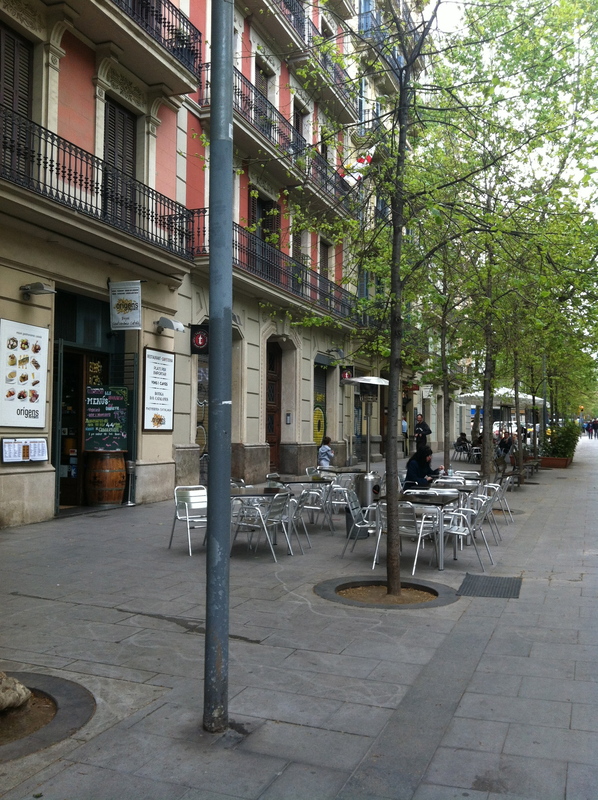 Then, I walked down c/Tallers, crossed La Rambla and made my way to c/de la Palla (“c” here stands for “carrer” which is “street”), where there’s a cute tea and confection shop, as well as what looks like a higher-end tapas place across the street. I stopped in Caelum, which is the confection shop. Their tag line is “Delicies i alters temptations de monestirs”. This is in Catalan, so my best guess is: Delicious temptations from alters and monasteries. I could be way off on this, so don’t hold me to it. I usually don’t like to patronize any establishment connected with “God”, but I heard the monks invented beer, so I was willing to give the believers another chance. Much of what Caelum had to offer was not to my liking in the sweets department, but I did spy some macaroons – not the hip, trendy ones that look like mini-sandwiches in various flavors that everyone is baking. These are the “old fashioned” ones that are basically egg whites, coconut, sugar and pinch of salt – period (see pic at top). These are my style of macaroons – coconuty, slightly sweet and toothsome. Yummmm. I walked through another little courtyard where there was a small open air market in which people were selling cheese, wine, and other small production items. I visited the honey guy and bought some local flower honey. Depending upon how good it is, I might go back and try the thyme honey.